The HG10 headgear from Fairtex offers thorough protection for all types of standup sparring. Using special multi-layer high-density foam core padding to protect against heavy strikes, with increased padding over the forehead, cheeks, and rear flap. Fastened by a lace-up top and padded hook-and-loop rear strap (padded to protect from blows to the back of the head). 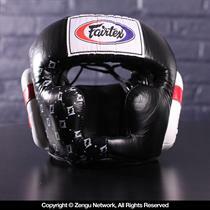 Email your friend about the Fairtex Super Sparring Head Guard - HG10 Black. Ask a question about the Fairtex Super Sparring Head Guard - HG10 Black.